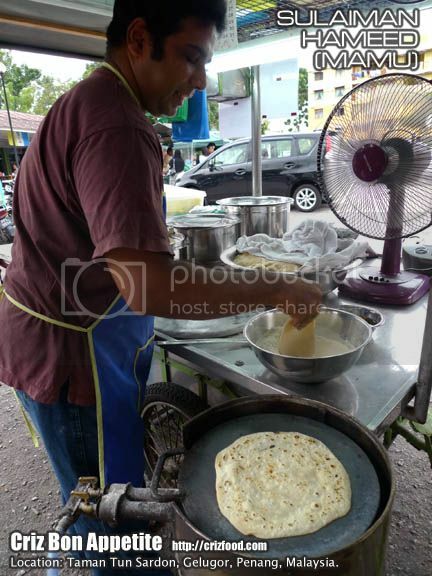 Not many people are aware that hidden at a little corner of the Pasar & Balai Rakyat Gelugor, Penang, lies a humble man by the name of Sulaiman Hameed (nicknamed Mamu and from a Pakistani parentage), selling his much sought after Chapati & Roti Jala. Some dignitaries such as the Governor of Penang and members of the Perlis royal families had the opportunity to try out his specialties. Even with the constant increase in ingredients prices, Sulaiman had without fail maintained his mother’s traditional recipe since he started his business 16 years ago. To him, he believed in serving his customers with the best while maintaining low charges. That’s the reason why until today, his steady flows of loyal customers are still queuing up to get hold of his soft and nutritious chapati. The Chapatis, flat unleavened breads made with the combination of atta flour (grinded whole wheat flour) and water, mildly toasted on a preheated dry skillet (tava). Thus, it’s and fiber-rich and low in cholesterol, making the bread healthy for just everyone, especially those with diabetics. The Roti Jala (Netted Bread or Lacy Crepe) on the other hand, is a local delicacy, especially during the fasting month in Malaysia. The mixture prior to being molded on a preheated skillet, “screwpine” brushed with oil, consists of flour, eggs, milk, salt, turmeric powder (coloring) and water. 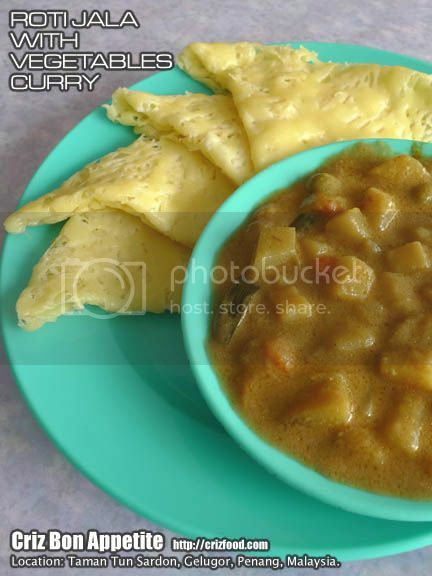 Both these delicacies would go well with any curry dishes. The Chicken Curry was way the best I had so far as the curry was amazingly fragrant from the thick creamy coconut milk, mint leaves, tomatoes and screwpine (pandan) leaves other than the usual herbs and spices. With each set ordered, they would be a slice of potato. This dish is my all the time favorite. 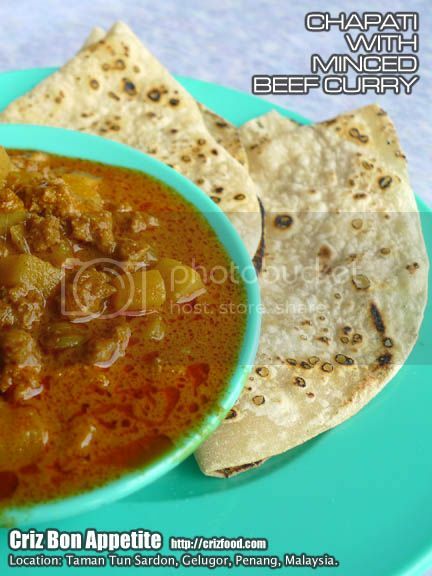 The Minced Beef Curry had a similar curry taste compared to the above but with distinctive flavors coming from the coarsely minced chunks of beef combined with potato cubes and onions. Beef lovers would love this dish as you won’t find any tough parts in this concoction. The Vegetables Curry was cooked differently as in korma style with traces of green peas, onions, carrots, mint leaves and potatoes. It had a slight nutty taste as I would suspect that grinded almonds or cashew nuts were added in for that creaminess and that mild fragrant from the added screwpine (pandan) leaves. It was tasty indeed. 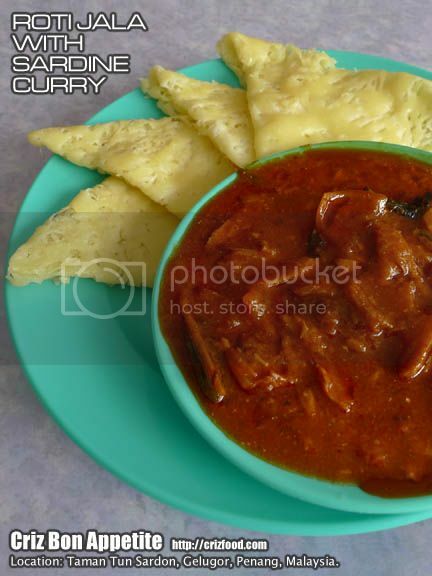 The last curry available would be the Sardine Curry. Of course, the dish would come from the tomato paste canned sardine stir fried with lots of sliced onions and green chilies. Somehow, the boss had a little twist in cooking up this dish by adding in mild spices and mint leaves with the right amount of sugar. I’m not a fond lover of canned sardines but this dish went well with the roti jala I had. 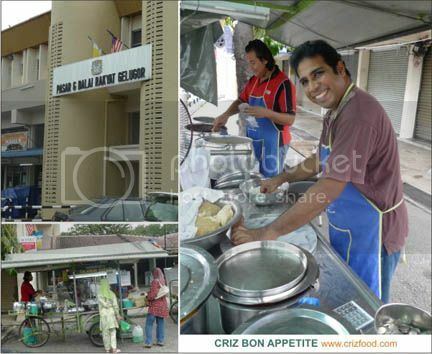 On top of selling chapati and roti jala, they would also have some sweet desserts such as bubur kacang hijau (mung beans porridge), bubur kacang merah (azuki beans porridge), bubur gandum (wheat porridge) bubur pulut hitam (black glutinous rice porridge), bubur ubi keledek (sweet potatoes porridge) and so on, alternate on different days. Each packet would only cost you RM1.30. If you are coming from the Penang Bridge via Jalan Sultan Azlan Shah in Gelugor area, keep to your right and drive all the way up to the traffic lights (Hindu temple on your left). Turn right into Hilir Pemancar (Post Office Gelugor is at the left corner building) and drive on for about 600m and you will see the beige colored roofing Pasar & Balai Rakyat Gelugor on your right. Turn right into the service road and you will see the chapati stall just next to the food court there. 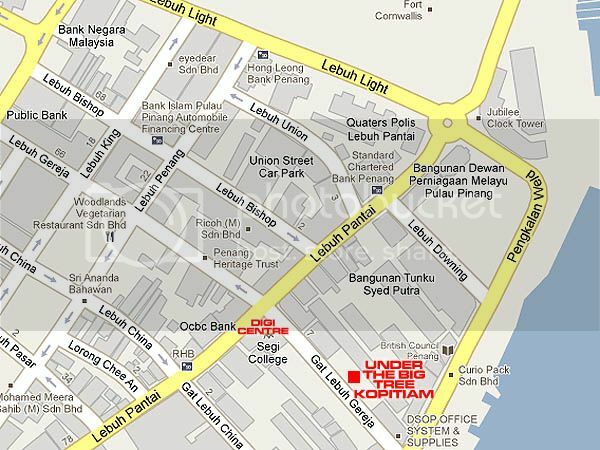 Residence Address: D-1-7, Taman Tun Sardon, 11700 Gelugor, Penang, Malaysia. Pasar & Balai Rakyat Gelugor (next to food court), Hilir Pemancar, 11700 Gelugor, Penang, Malaysia. When you mention about Street Western Food in Penang, you would get lots of responses that this place is the best or that place served the best whatsoever, from Pulau Tikus area until as far as Fettes Park, right? It’s true that each has their own signature dishes but one thing they have in common is the usage of frozen mixed vegetables which I’m not so much in favor of. Hard green peas, barely fresh frozen vegetables or even tasteless frozen vegetables from China were some of the complaints I mentioned constantly. Some of my friends even suggested that I visit hotels or posh restaurants since I’m so fussy. LOL! Well, I can now prove that you are wrong. I had discovered and revisited this new treasure of mine for the last 4 months just to be certain that they are consistent enough to serve you the best in presentation, freshness and taste at the price of general Street Western Food. 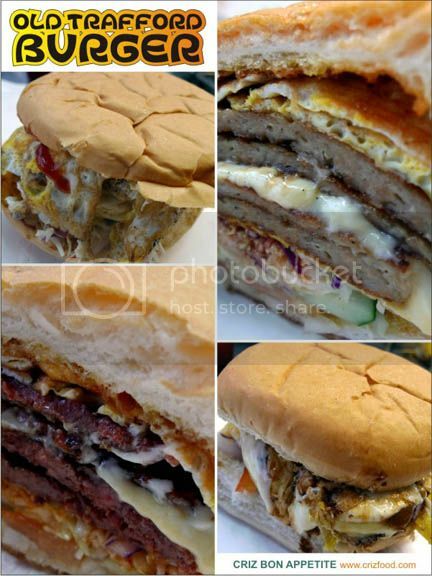 Welcome to the latest gem in the world of Street Western Food – Diner’s Choice Western Food. The first thing that I would normally do when visiting any Western Food outlets, whether it’s street or restaurant would be to try out their mushroom soup. I have read from many blogs about the soup served at some of the prominent Street Western Food venues and most of them would compliment on the cheap pricing of RM2.50-RM3.00 per bowl. Of course, those bowls of soup would be cheap as they are mostly stirred up from instant mix. At Diner’s Choice, a few varieties of fresh mushrooms were carefully selected, toasted, blended and cooked in a secret recipe that you would yearn for more. 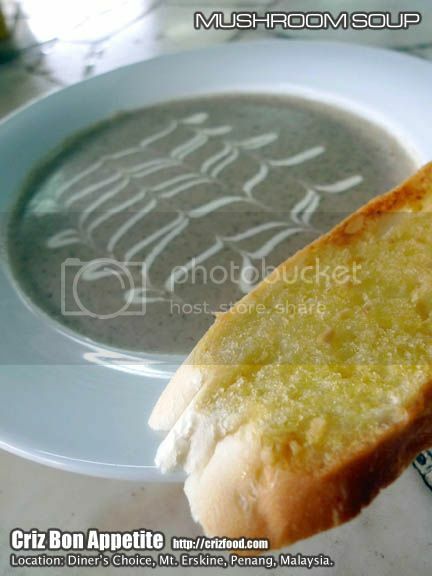 Their thick, creamy and flavorful Mushroom Soup (RM5.00nett) would be presented beautifully in a wide dish, together with a slice of garlic bread. For those who do not have such a big appetite, I have to forewarn you that you might not be able to finish up the soup since the rest of the main course could be such a big portion too. The main course would consist of chicken, beef, lamb and fish, prepared in your preferred style of cooking – grilled, batter-fried or baked. 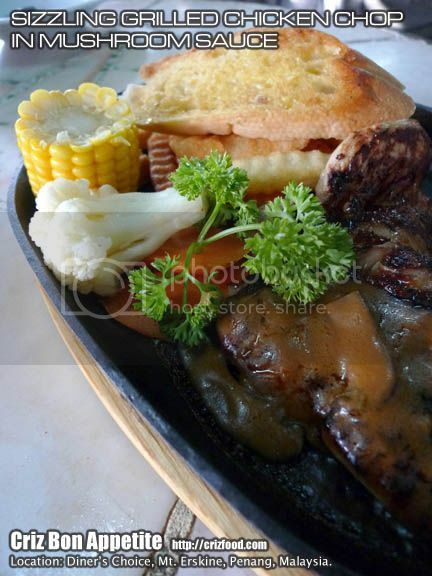 You also have an option to choose from 3 types of gravy, namely black pepper sauce, garlic sauce and mushroom sauce which had been specially pepped up in taste with brandy. What? Brandy? Yes, indeed. 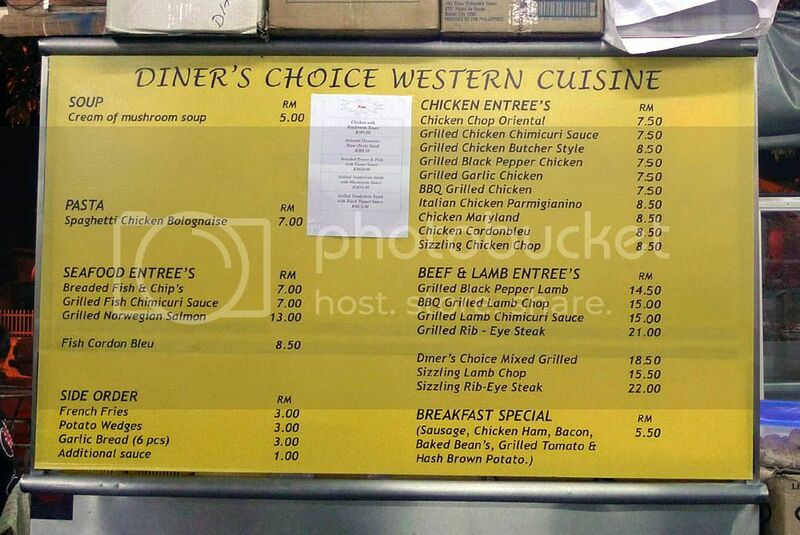 This is what made Diner’s Choice unique compared to the rest as they believed in providing their diners with the best without charging them extra. 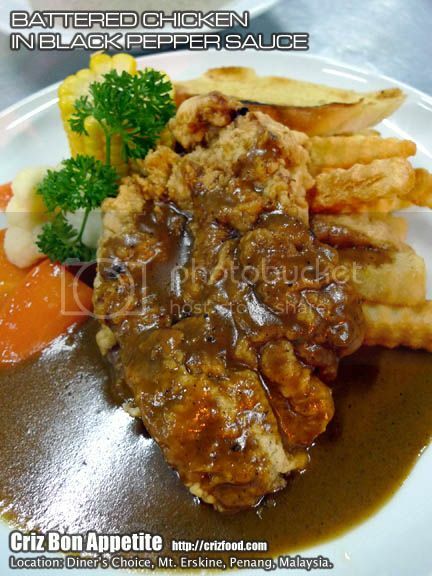 Let’s have a look at their Batter-fried Chicken in Black Pepper Sauce (RM9.00nett). The presentation alone had already stunned me at first sight. You won’t get such a presentation with so much of fresh side dishes anywhere else except in a restaurant. The chicken fillet was actually from a deboned drumstick, dipped in batter and deep fried to perfection. The only problem would be the gravy soaked meal. It would be advisable to request for the gravy to be served separately in a small bowl. The black pepper sauce was not that pungent as I would have expected. It had that mild peppery taste with traces of some herbs and fragrant sweetness from the brandy. It would suit even a child’s taste bud. 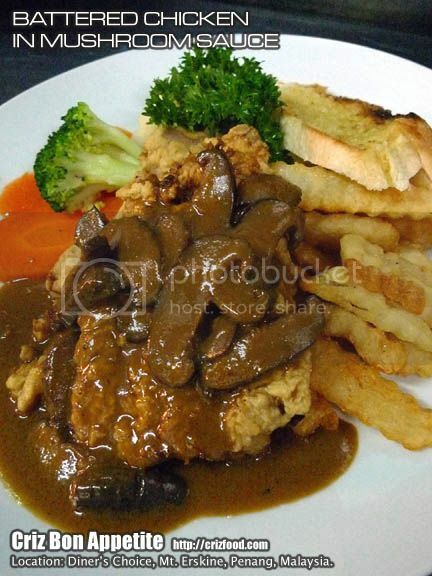 The Batter-fried Chicken in Mushroom Sauce (RM9.00nett) was similar to the above except that this time I had different gravy. This style remained my all-time favorite as the slices of Shitake mushrooms has soaked up all the flavors and brandy from the gravy, giving each bite a squeeze of heaven. It went well with any choices of meat. There was one item on the menu board that caught my attention. It was the Grilled Chicken Butcher Style (RM8.50nett). I was fooled by the name as it was just grilled chicken spread with my selection of garlic sauce and topped with just a sausage and half a piece of ham. The garlic sauce on the other hand had that nice taste from the chopped garlic, mild traces of black pepper and herbs in brown sauce. 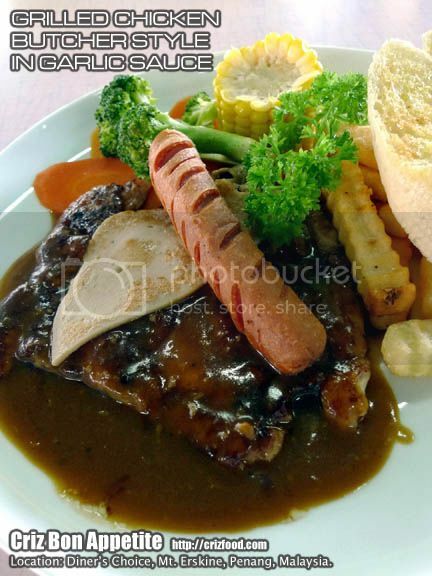 I also tried out the Sizzling Grilled Chicken Chop (RM8.50) served in my favorite mushroom sauce. It was delicious as the chicken was well marinated and grilled, on top of having that extra charred flavor from the hot plate. The only disadvantage was that my gravy dried up too fast until I had I request for additional top-up. 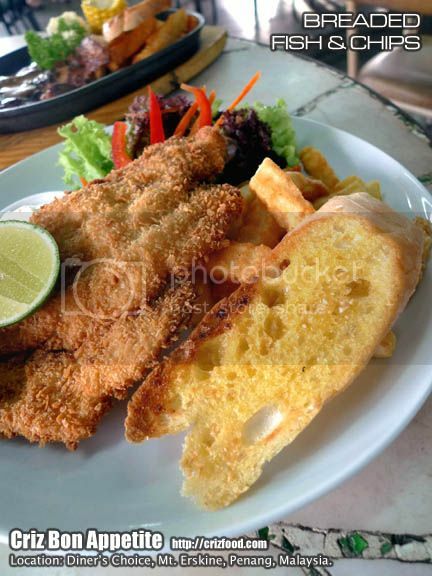 The Breaded Fish & Chips (RM7.00nett) was just normal. I found the cut to be a bit too thin and considering that dory fillet was used here, it did not have the required juiciness. I won’t mind paying a bit more if barramundi (siakap) or gold-banded jobfish (kalak) fillets were used here. Unless you love the fish fingers like texture and bite, this dish would not be my preference. There’s one dish that I saw many repeated orders and that was the BBQ Grilled Chicken (RM7.50nett). The dish was indeed delicious. 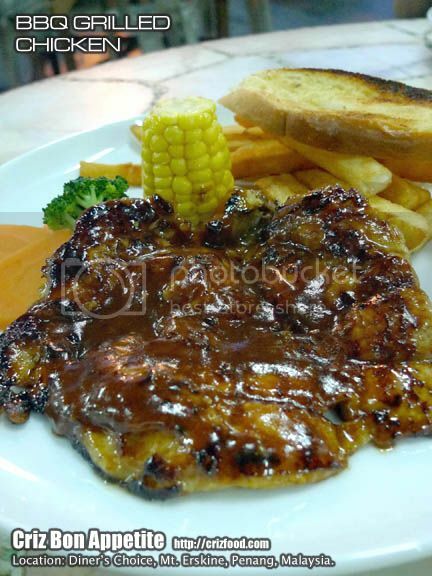 The pounded chicken drumsticks fillet had the right flavors and combined with the chef’s specially prepared BBQ sauce, it was very palatable to anyone’s appetite. 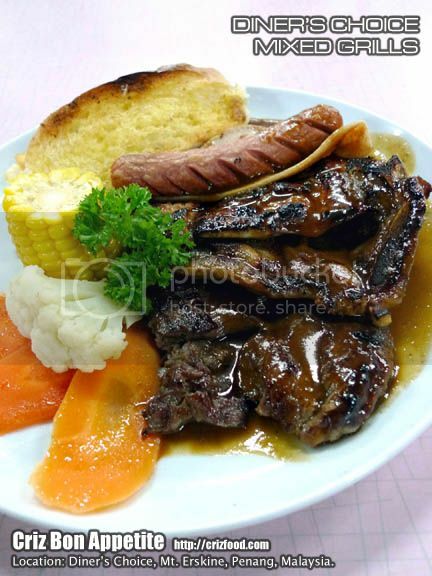 For meat lovers, you sure would love the Diner’s Choice Mixed Grills (RM18.50nett). It came with well marinated grilled beef rib-eye steak, lamb shoulder, chicken drumstick, ham and sausage, with a substantial amount of fresh greens and chips. If only my stomach could contain so much, I won’t mind ordering a second helping. You can choose your choice of gravy here too or you can leave it to the chef to decide for you. Another unique dish of theirs would be their Chicken Cordon Bleu (RM8.50nett). Instead of being presented in a dry form as what others would do, this deep fried ham and cheese stuffed chicken fillet with breadcrumbs came with the chef’s special oriental sauce. This tangy yet mildly sweetened sauce blended in real well with the chicken. Who said that Street Western Food must have those common items and not something out of the norm? The chef did a great job in presenting a few international dishes in his menu. 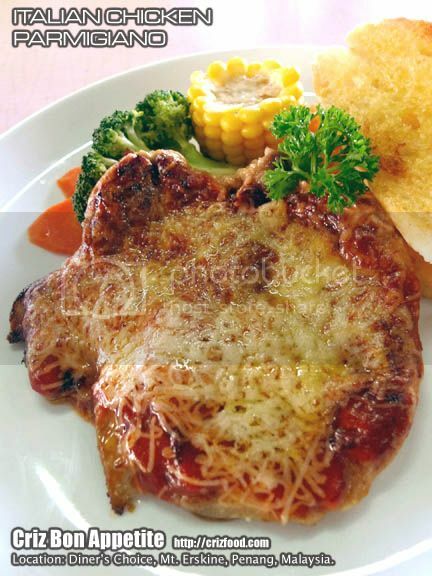 One of the more noticeable ones would be the Italian Chicken Parmigiano (RM8.50nett). It looked almost like a pizza. Instead of a pizza base, it had the chef’s specially concocted tomato base, spread on a chicken fillet, topped with grated Italian Parmigiano-Reggiano hard cheese (normally substituted with the French’s version of Parmesan cheese) and baked to perfection. Just a look at the dish and you can be assured of the juiciness that remained within the meat. 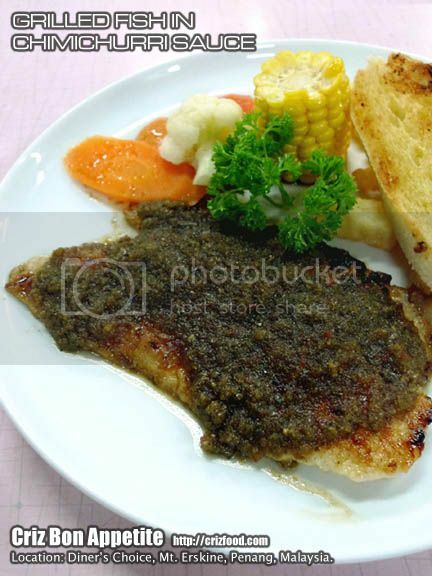 Another great recommendation would be their Grilled Fish in Chimichurri Sauce (RM7.00nett). Though it was still dory fillet being used here, at least this version maintained the moist within the fillet. The Argentine-influenced green colored Chimichurri sauce was actually the chef’s own recipe with hints of minced parsley, garlic, olive oil, red chilies (instead of red pepper flakes) and more. It was a bit spicy with a touch of sourness but it suited the fish fillet well. Overall, this stall does provide great Western dishes at a reasonable price. Since this is just an open air coffee shop with another stall selling stir fried dishes, it might get stuffy at times with all the oil flying about. There are a few tables away from these stalls for your dining pleasure. You can check out a bigger version of the menu board here. As the stall within a residential coffee shop is not visible from the main road, it would be hard for those who are not familiar with the vicinity to locate it, especially using some of the small lanes which would also lead to the venue. The easiest way would be by identifying certain landmarks. If you are coming from 1-Stop Midland Park Centre along Jalan Burma, just drive all the way to the Jalan Burma/Jalan Bagan Jermal traffic lights. Drive straight towards Mt. Erskine and keep to your right. After about 1km, you would reach another traffic lights (turn left would lead you to Hong Seng Estate). Switch on your right indicator. Immediately after the traffic light, turn right into Tingkat Mt. Erskine 1 (you can see a Chinese temple at the junction on your right and a fruit stall on the other side of the junction). Turn right into the first junction (Lengkok Mt. Erskine). Drive further up and you can see the brightly lighted up coffee shop on your left at the junction of Gerbang Erskine (Erskine Grove). 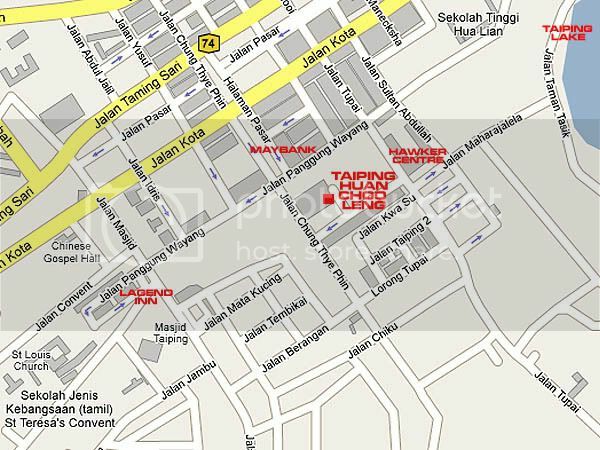 Address: 1 Gerbang Erskine (Erskine Grove), Mt. Erskine, 10470 Penang, Malaysia. If you are a Curry Mee lover, you would have noticed that the price for a good bowl of the noodles can be rather costly now. Even with an average price of RM3.50 per bowl, you can hardly get substantial ingredients in it. If you were to add in more “fresh toppings”, a bowl might cost you more than RM5. Do you always face this problem while dining out? With the increasing cost of living in Penang, most of us would seek the next cheapest alternative which might not be to our likings. Well, you should pay this humble Curry Mee auntie along Jalan Delima a visit as she’s doing the business not for profit but to pass time and she has been doing this for almost a decade. A normal bowl of her Curry Mee with lots of ingredients would cost you only RM2.80 and her portion would be based on your body size WITHOUT additional charges. Amazing! You can always add on more ingredients as per your liking but just wait until you see her large bowl of Curry Mee at only RM3.20. The bowl would come with FIVE FRESH PRAWNS plus lots of seafood. This bowl would at least cost you RM5-RM6 elsewhere. You can either choose yellow noodles, bee hoon (rice vermicelli) or a mix of both for your Curry Mee. Each bowl would come with bean sprouts, prawns, cuttlefish, cockles, pig’s blood jelly, tofu puff (tau hoo pok), garnished with fresh mint leaves and served with a spoonful of sautéed shallots chili paste. The chili paste here would not be as spicy hot as most stalls she did not add in dried chilies. Overall, the Curry Mee served here was quite nice to my liking as it did not have that much coconut milk usage. The dish is more towards the clear soup version with a slight salty sweet taste. What attracted me most was the size and freshness of the prawns as she would only cook them when necessary. Now you know why I rather order a large bowl of the Curry Mee? It’s because I love fresh seafood~ Haha! There is one important note to those who wishes to dine in her humble little place. PLEASE BRING YOUR OWN BEVERAGE as the old auntie here DOES NOT SERVE any drinks. Most of her patrons are workers and housewives, thus barely anyone would dine at her place. Another thing would be the operating hours. Most of the time, her Curry Mee would be sold out by 9.30am. So do try to go as early as possible. I’m sorry I can’t provide her contact here as she had requested for some privacy. It’s not that hard to locate the place as the stall within a row of houses is just towards the end of Jalan Delima, leading to Jalan Yeap Chor Ee. If you are driving towards the Penang Bridge along Jalan Mesjid Negeri, keep to your right and watch out for the second traffic lights right after Lam Wah Ee Hospital. Turn right into Jalan Delima. You can see the former N.G. Lighting shop (on the left) and a car seller shop (on the right) of the junction. Drive all the way up until you have passed two large fields. Immediately after Field 2, slow down and keep to your left. The stall, within the compound of a house with BLUE awnings, is just 10 houses away from the second left junction. 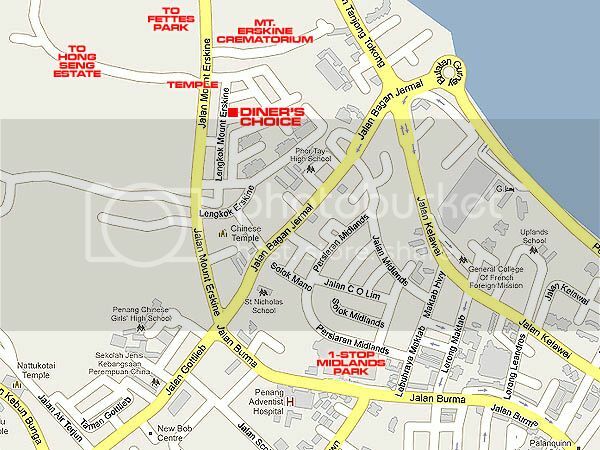 Address: 9B Jalan Delima, Island Glades, 11700 Penang, Malaysia. 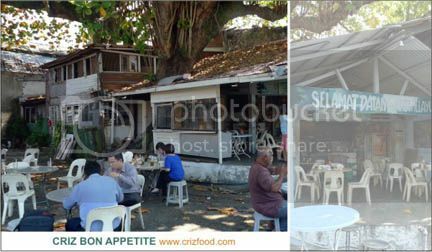 With the success of Hammer Bay Seafood next to the Gold Coast Resort Condominium, Bayan Lepas, Penang, more and more of such beachside seafood sheds wannabes have started to mushroom along the coastal highway nearby the inhabited beach areas of Bayan Mutiara near to the jetty to Pulau Jerejak, Penang. How successful are those “I donno if it’s legal to set up there” stalls? 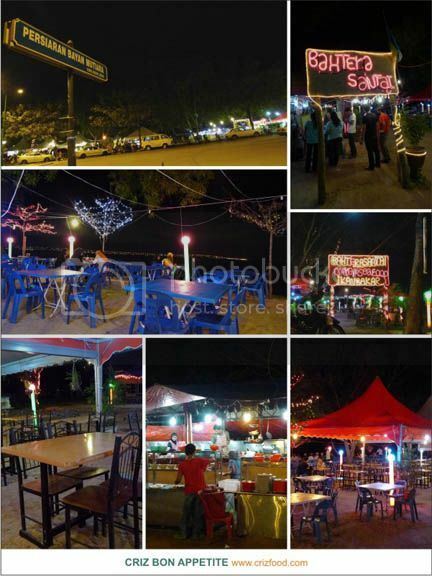 One such place would be the Bahtera Santai Seafood & Ikan Bakar stall, with romantic settings, dim lights and under the canopy type of dining ambience with a panoramic view of the Penang Bridge. 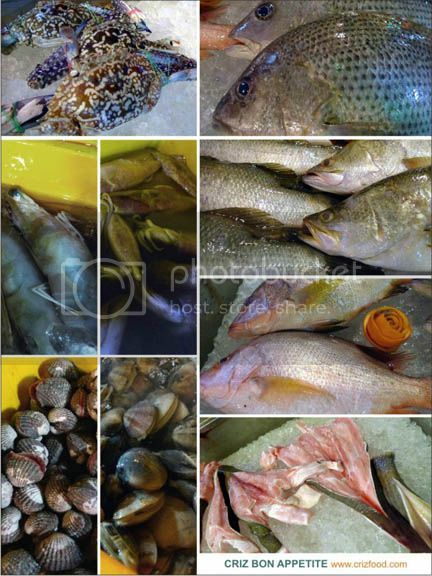 The stall would serve lots of fresh seafood obtained from fresh daily catches of the local fishermen. Now come to the part of taste, price and attitude of the staff. I have been quite lenient and frank about food quality of the Penang’s food industry, regardless of whichever type of cuisine, but whatever being served here were way beyond my expectation. On top of that, the serving system was rather chaotic with our second order of drinks never came at all. Let’s just have a look at the Mee Hailam (RM4.00). As for price wise, it was at normal market rate. As for taste wise, I would advise you to get some health insurance, just in case you have kidney problem resulting from too much of the food here. The “lye water” enriched yellow noodles with some vegetables combined with the barely traceable small chunks of chicken meat were practically swimming in a pool of fishy stench salt water. What pondered me was the presence of the fishy taste when there were not even any traces of seafood inside the dish. The Fried Salted Fish Rice (RM4.00) was another disastrous dish. They were using the cheapest salted fish (mackerel/ikan kembong), without even deep frying the flesh. The whole plate of fried rice was overpowered by the salty and fishy salted fish chunks. The Deep Fried Squids in Batter (RM23) tasted quite fine although they were a bit “over-battered”. Well, you’ll never get them wrong with the easily available “KFC frying flour” and Thai chili sauce. However, I was fumed over the price! How could 3 six inches squids cost as much as RM23? 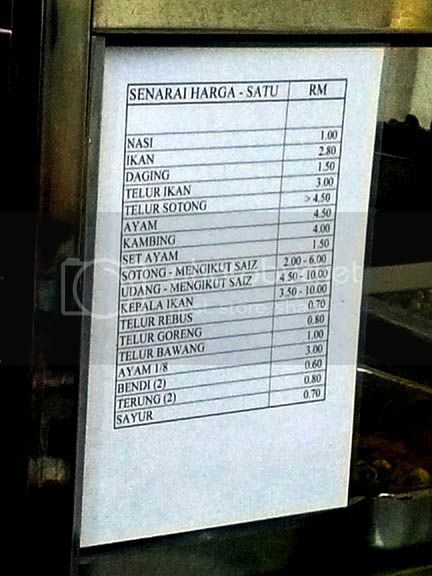 Even those famous Malay seafood places, such as the Hammer Bay Seafood is charging merely RM5 per plate. Are they trying to slash our throat just because we were not locals there? I did asked the cashier if the price charged was for the whole list of items ordered and she just ignored me and continuing calculating the bill. What an attitude! After passing me the bill, I kept asking at least 3 times if the amount charged was right and she nodded. Well, all the proof of the squid sizes and bills are displayed below. Do I need to say more? 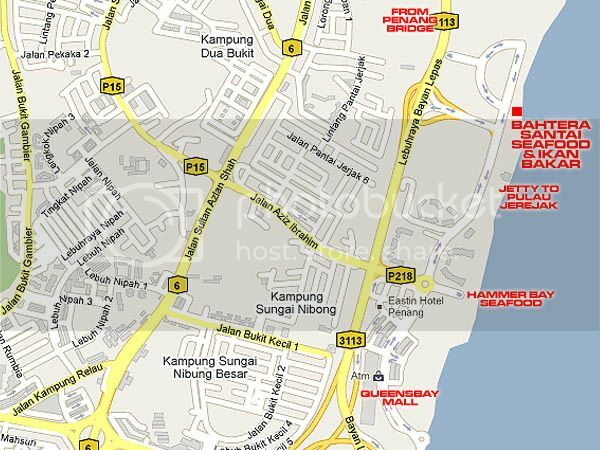 It would be easier to reach the restaurant if use the Jelutong/Bayan Lepas Expressway. Just follow the direction towards Queensbay Mall. Drive on until you see an overhead pass when nearing the mall. Watch out for a signboard (as shown below) to Pulau Jererak Resort & Spa. Turn left into the road and drive until the T-junction. Just turn left and drive a bit more and you will see the beach stall on your right. Address: Bayan Mutiara, 11900 Bayan Lepas, Penang, Malaysia. Nowadays, with the increased price of most raw ingredients, dining at a posh restaurant would not be the chosen choice for most families with kids. From my knowledge, more and more families are looking for places with reasonable priced servings and taste just to ease on the family’s monthly food expenses. Just as a comparison, I had a double Bratwurst Sausage served with mashed potatoes and mixed vegetables at a prominent mall in Penang not long ago. With all the taxes added in, it cost even more than the 5 dishes I had ordered at a stall that I had stumbled upon recently. The only difference is that this place did not have air-conditioning. 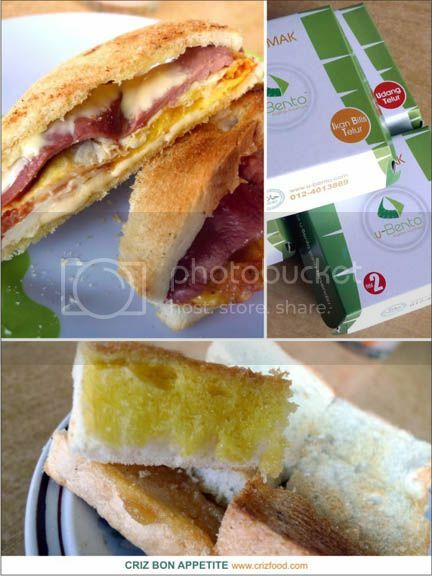 Let’s look at what Asian Whisper’s located within the Delima Mas Café has to offer. The single Bratwurst Sausage (RM7.00 nett/set) served with a huge scoop of mashed potatoes plus delicious brown sauce was far better tasting than the one I had earlier at Straits Quay. Even with a double serving of the sausage, it would only cost me RM11.50 nett/set compared to the one I had at RM20.90 (excluding taxes), which of course came with some extra “discarded” mixed greens. The next dish was the Sausages with Onions (RM5.00 nett). 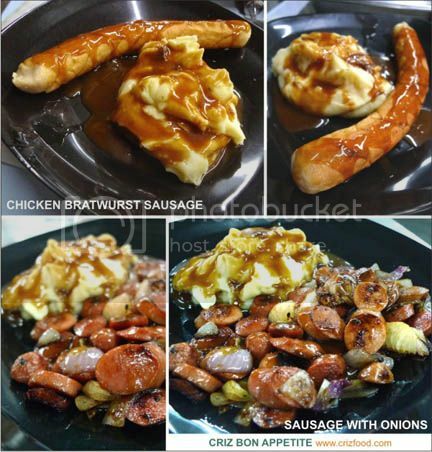 The dish had 2 sliced honey chicken sausages plus one sliced chicken frankfurter sautéed with sliced onions in LP sauce and served with a huge scoop of mashed potatoes with brown sauce. This dish would be quite ideal for those light eaters. 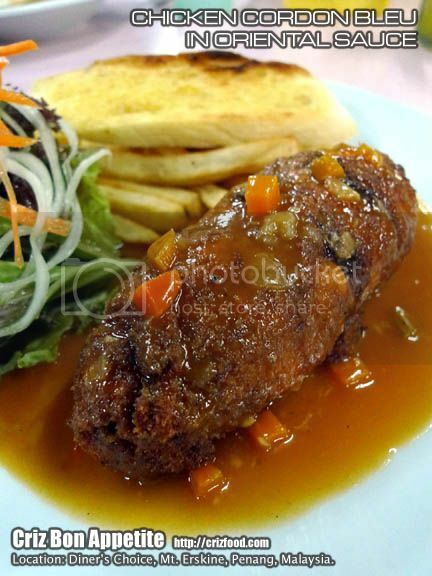 The next dish was even lighter – Roti Ayam (RM3.00 nett/set – a poultry version of the normally minced pork version). The taste was average, considering that the chef changed her usual preparation methods to suit the taste buds of the local people there. I found the filling to be a bit too moist and there were only some “too finely minced” chicken plus “overcooked” onions in it. This dish lacked the textures and bites. The chef should have added some chopped cabbages and carrots for that extra crunch. Moreover, the minced chicken should be cooked more coarsely rather than having a sandy and no bite like texture. A bit more of the 5-spice powder would also do more justice to the overall taste. 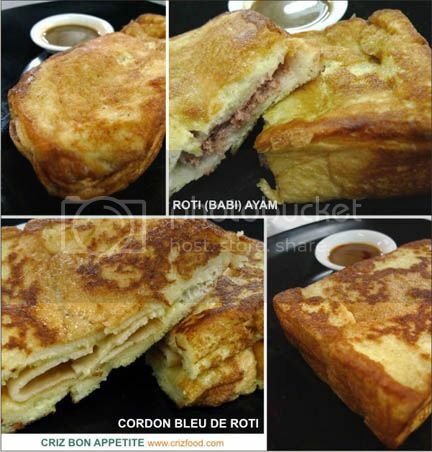 The Cordon Bleu de Roti (RM5.00 nett) was normal. It had a piece of chicken ham and cheese clamped between two slices of white bread, dipped in beaten eggs and fried to perfection. Both of the light meals were served with LP mixed with chili sauce. 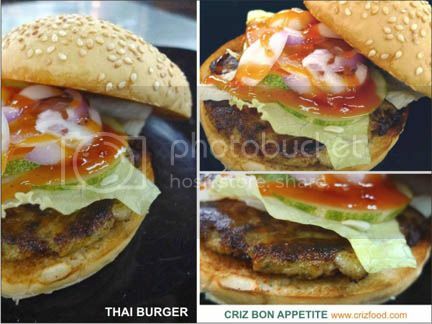 I was curious on how the Thai Chicken Burger (RM3.50 nett) would taste like. Well, the preparation and presentation were exactly how you would get from the roadside burger stalls except that the patty was home prepared. It had some hints of turmeric powder with sliced kaffir lime leaves. It was really mild even for kids. I would have expected it to be more spice and herb enhanced but I guessed it was another local preferred taste. Moreover, the patty was a bit too thin for a prominent bite. I actually don’t mind paying a bit extra for a thicker patty but that would be over the budget of the locals here. The choice of bun was perfect. It was almost McD like with sesame seeds sprinkle above. 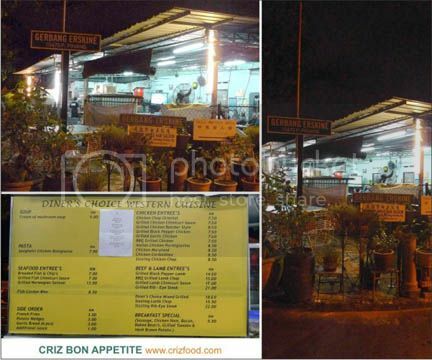 You can also get Crinkle Cut Fries (RM3.00 nett) and Hot Dog (from RM2.50 nett onwards) here. What surprised me most is the stinginess of certain district locals. Prices of raw ingredients had gone up crazily and yet they still expect to get the same size of food with the same amount they paid years ago. Thus, you would still have food as all the above mentioned, priced at RM23.50 nett, much cheaper compared to just a dish at a local mall (RM24.25 nett). So, as a household head, would you go for mediocre food that would feed more mouths in your family or one that would feed only yours? Please take note that this is the place ONLY for early dinner. The shop will close slightly before 10.00pm. Other than this stall, there is a bakery there for fresh buns and cakes. (The mini chicken pie is not bad at RM1.20 each but only on weekends), economy rice, nasi Melayu, nasi kandar, roti jala, char hor fun, bak kut teh, sweet & sour pork rice and chicken rice/hor fun (not bad… all boneless chicken given). If you know how to get to Genting Café where the famous peanut butter based chee cheong fun is, you would surely know how to get to this café as it’s situated right at the other end of the shop houses. Drive all the way up Jalan Mesjid Negeri towards Penang Bridge. Immediately after Lam Wah Ee Hospital, keep to your right and watch out for the last traffic lights before the underground tunnel to Penang Bridge. At the traffic lights, turn right into Jalan Delima. Keep to you left and turn left into the first junction (Lorong Delima 6). As this is a one way street, you have to make a left turn into Lorong Delima 3 then right turn into Lorong Delima 5 and another right turn into Lorong Delima 7. 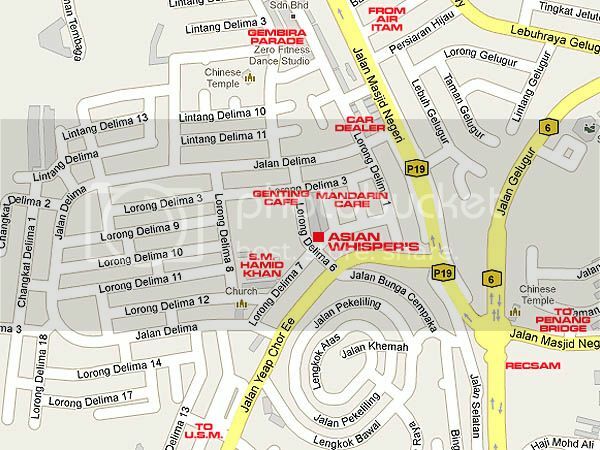 Delima Mas Café is just at the corner of Lorong Delima 7 and Lorong Delima 6. 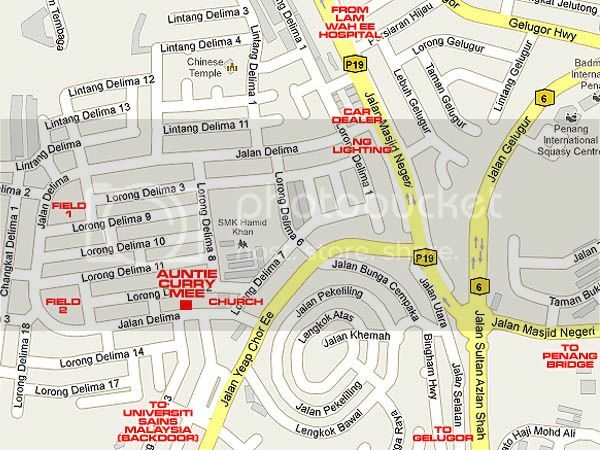 You can find some parking spaces along Lorong Delima 6. With a never ending appetite for Thai cuisine, I have constantly been exploring all those secluded areas in search of delicious spreads. There’s this little Thai food stall, located within the premises of a corner coffee shop, nearby Universiti Sains Malaysia (USM) in Sungai Dua area. 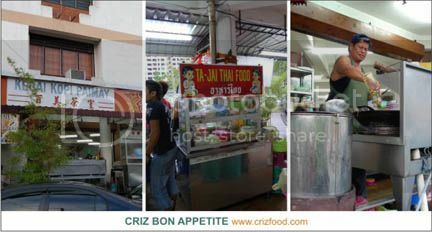 This stall has been pepping up nice stir fry (choo char) Thai dishes for many years, mainly to cater to those frequent university students as well as workers around that vicinity. That stall which has been known for its cheap and good (C&G) Thai food, is manned by a few local Thais and goes by the name of Tajai Thai Food. I have not been visiting this place for quite some time now and decided to pay them a visit recently. Cheap? I won’t say that, unless you order fried rice/noodles with a sunny side-up, as what those students would do. Good? This is again a topic for debate. Unless you are an expert in combining your Thai dishes, the dishes might not turn out to be how you would want them to be. Your combination might end up to be a bunch of sweet and spicy dishes as the Thais are believed to have sweeter taste buds. Let’s just have a look at some of dishes I had tried through a few visits. First there was the Fried Chicken with Cashew Nuts (Kai Pad Met-Mamuang – RM9.00). Instead of being presented in gravy form, this dish has batter coated chicken fillets with some sliced Kaffir lime leaves, stir fried in some sweet sauce with a light hint of fish sauce. These came with some fried cashew nuts. This dish was not bad, except that it could be quite dry without any gravy. The next dish was the Stir Fried Chicken with Basil Leaves (Kai Pad Krak Praw – RM8.00). This chicken dish has the right combination of Thai basil leaves, shallots, garlic, red chilies, fish sauce, dark soy sauce and many more ingredients. The only difference compared to the others was the usage of chilies. It did not have the spiciness from some smashed bird eye chilies, which made this dish quite ideal for all age groups. You would be surprised that their Thai Onion Omelette (Khai Cheow Homyai – RM3.50) was so simple and yet so appetizing. With high heat and lots of oil, you would get a crispy omelette. The only setback was the excessive oil remains at the base. They should have drained it well. Their Sambal Asparagus (Pad Phak Naw Mai Farang – RM8.00) was a new experience. Instead of using stalks of asparagus, the vegetables were sliced thinly (just like French beans) and stir fried with lots of prawns in a more diluted version of Thai sambal. The dish has more hints of oyster and fish sauces. There are all together about 100 types of dishes to choose from the menu. Another of the common ones would be the Special Thai Omelette (Khai Yad Sai – RM7.00), a wrapped omelette with meat and vegetables. I somehow detested the usage of frozen mixed vegetables in dishes. This is the most disappointed dish I had there as it was just some mixed vegetables stir fried with minced pork with a touch of chili sauce and wrapped in a tasteless omelette. I won’t recommend this dish as it did not have any distinctive flavors. Fortunately, the Green Curry Chicken (Gaeng Kheow Wan Gai – RM8.00) was reasonably good. The dish was not as spicy as expected without the usage of bird eye chilies. Instead of the mini Thai eggplants being use here, it has a bigger version and all sliced up. There were some cut long beans being added in too. The Bangkok Pandan Chicken (Kai Bai Toey – RM6.00 for 5 pieces) was another disaster. They were practically swimming in oil. If not with the help of some tissues, I would have put them aside. There were neither traces of any spices nor sliced lemon grass being used here. Each pandan (screwpine leaves) wrapped chicken just tasted sweet with a hint of soy sauce. Banned! 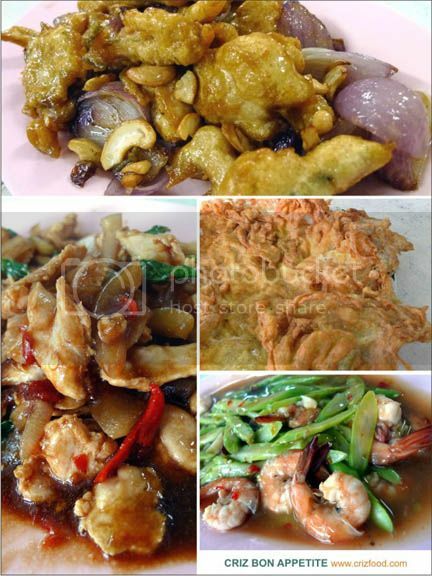 Their Fried Prawn Cake (Tod Mun Koong – RM3/pc) was not up to my expectation too. I just do not know how such a simple dish could have that somewhat almost fermented seafood flavor in it. It could be due to the not properly stored lard being used in it too. Now I know why most of the students would go for their fried rice or noodles as it could be safer for their digestive systems. I did try out one of their noodles to test on the flavor. Their Seafood Tomyam Glass Noodles (Tomyam Woon Sen – RM5.50) sure had lots of squids in it but it was not my plate of noodles. Somehow the noodles tasted real sweet with the usage of some Thai chili sauce with a dash of fish sauce. Overall, this stall serves average Thai dishes which would suit common people. 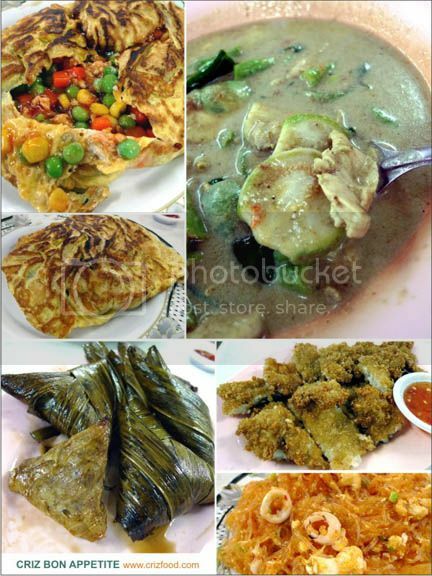 If you would like to have a more authentic Thai cuisine, it would be better to go for Annathai-Kitchen or Aroi Thai Restaurant, both shops located in Pulau Tikus, Penang. 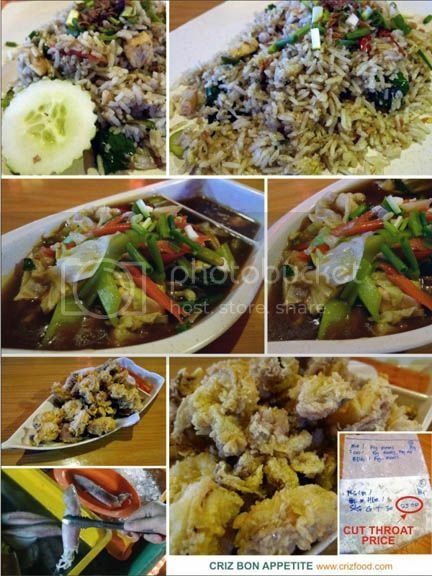 In fact, Lang Sae Lee Thai Food down at Tan Jetty, Weld Quay, Penang, also serves an above average Thai cuisine but the prices had soared sky high recently and most average income people are avoiding them. If you are driving up from Gelugor area, drive all the way up Jalan Sultan Azlan Shah towards Universiti Sains Malaysia (USM). When you see USM on your right, keep to your right until you reach the traffic lights (Sunny Point Complex on your left). Turn right into Jalan Sungai Dua. Drive on until the third traffic lights (Tesco Extra on your right) and turn left into Lintang Merak. Immediately after the first junction (Jalan Merak), slow down and watch out for a service road on your left. Turn left into the road and you would see the Thai food stall at the far end of the row of shop houses within the premises of Kedai Kopi Paimay. There will be ample parking space there. Do take note that you may encounter parking problem on Saturday as there will be a night market (pasar malam) on that day. Sometimes, it’s great to dine in where no one else would ever take a second look at when passing by the place. 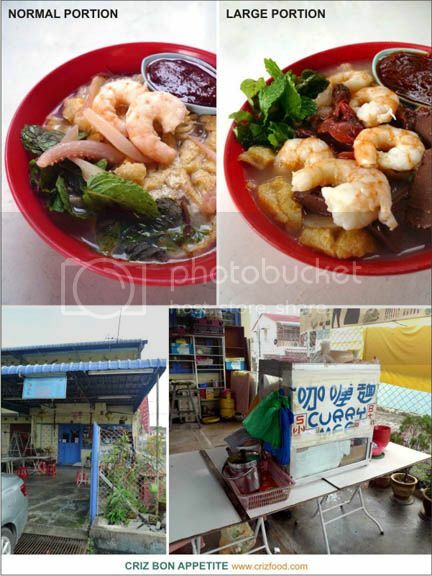 Who knows you might just stumble upon another hidden food treasures of Penang. Located within the heritage stretch along Church Street Ghaut (Gat Lebuh Gereja) right under a big huge tree, is a little shed, that had been pepping up delicious meals for those office workers around that area for many years. The place looked like it has been worn out through time but no one could have imagined that such a place would churn out meals that got many loyal customers coming back for more. Commonly known as Under the Big Tree by the locals, this little kopitiam is manned by Ah Lai and his wife, Ah Lim and their son. So what’s the fuss over this kopitiam when they would just serve any common meals like some of the old coffee shops or mamak stalls scattered around Georgetown? You would be surprised as they have a truly 1-Malaysia concept here where all races would come in daily to have a boost of their delicious meal, basically instant noodles soup and toasted bread. Huh? Are you serious? Indeed I am! 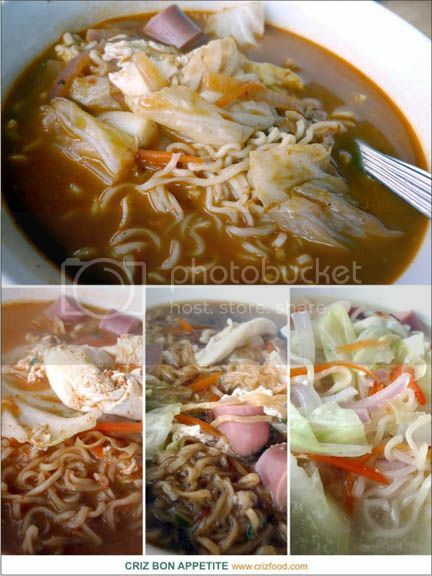 They do serve delicious instant noodles (RM3.50 per bowl – Maggi Mee to be precise) just like how you would cook at home, boiled with some cabbages, carrots and big onion, topped with a poached egg and 4 parts of a sausage. Next you would be asking why you should be paying for that amount when you could easily cook your own at home, in fact much cheaper than that pricing. The secret lies within the soup base. You surely won’t get that taste as you would here. On top of maintaining the al dente of the noodles, Ah Lai somehow managed to perfect his secret paste to be added into the soup. On top of that, some of the noodles had some evaporated milk added in for that extra creaminess. There are four types of noodles you can choose from here ranging from Clear Soup Noodles, Duck Noodles, Curry Noodles and Tom Yam Noodles. The Curry and Tom Yam Noodles are the two most sought after noodles here, a bit spicy for many but they were definitely delicious. Their toasted breads here are indeed done to the crisp I always like. This place has been my second alternative for toasted bread after Ah Wang’s Cafe at Tanjung Tokong. The Toasted Butter & Kaya Bread (RM1.40/set) has the eggy type of coconut jam (kaya) just like how my granny would have made. What got the customer coming back for more were not these toasted breads or their half boiled eggs but their Toasted Sandwich Special (RM3.80). This item was so uniquely prepared that it would only be available at this place. The bread would be laced with some cheese, topped with omelette, sausage slices and sauce prior to being toasted. The sausage has been carefully peeled to get even thickness, thus you would get an even flavor throughout your bites. 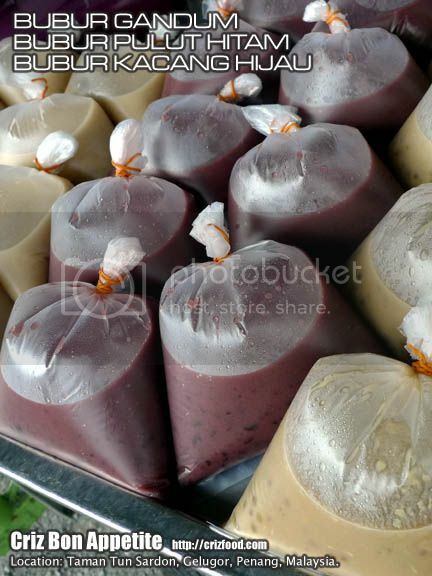 Other than these, there would also be some Nasi Lemak in-a-box (RM2 each) with different combinations, supplied by other vendors, for you to choose from. It would rather easy to find this kopitiam as it is situated right under the biggest tree you can find along Gat Lebuh Gereja. If you are coming from Lebuh Light, you would come to a roundabout (aluminium betel nuts sculptures/Queen Victoria’s Memorial Clock Tower). Make a 270 degrees right turn into Lebuh Pantai. Drive all the way and make a second left turn into Gat Lebuh Gereja. You can see the stall on your left. There would be ample parking space there. 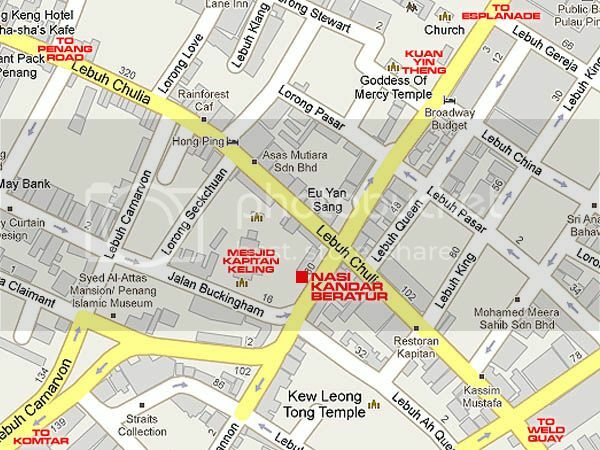 Address: 15, Gat Lebuh Gereja, 10200 Penang, Malaysia. I had thrown this question to many of my friends on how to find great food in Penang. Towards the end of the day, the most frequent answer would be, “If you see a long waiting line or a crowded eatery, you can be assured of the best food.” Well, that would not be true always as there are many different types of patrons with different urges, needs and budget. 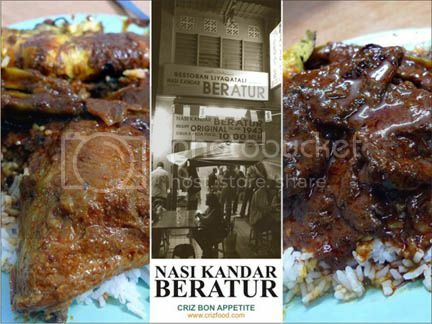 Let’s have a study on one of the more famous eateries in Penang – the Nasi Kandar Beratur who has been operating at the present premises since 1943. Do you have the patience to queue up for hours just to have your plate of rice with your selected curry dishes? 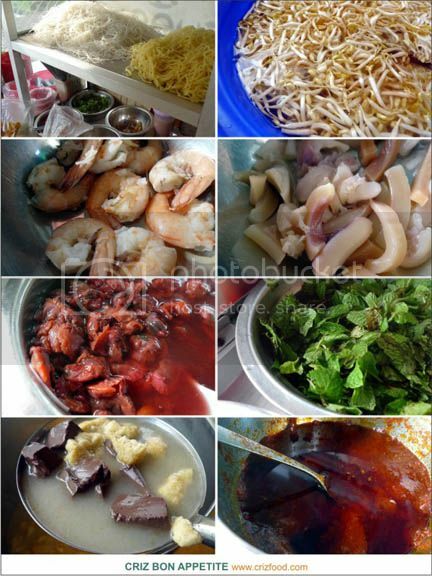 Do you consider them as one of the best in Penang in terms of taste and price? 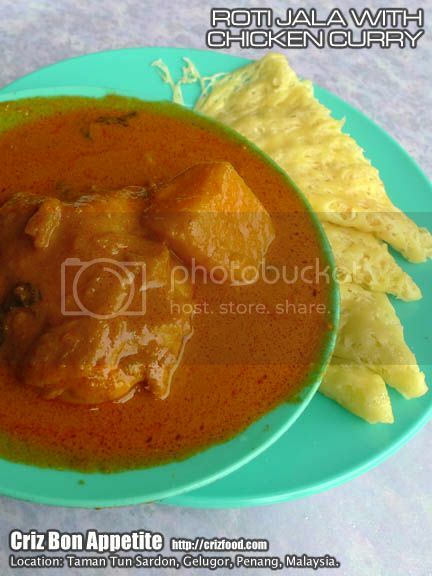 With more than 6 decades of experiences and a claim of having the most original taste amongst the rest of the Nasi Kandar restaurants in Penang, indeed the ingredients used were freshly grinded and tasteful. As for price wise, it was quite standard in Penang, nevertheless cheaper than those from other states. Just for comparison, a plate of rice (RM1) with onion omelette (RM1), a full drumstick (RM4.50), a piece of beef (RM1.50) and 2 steamed lady fingers (60sen) would cost you RM8.60. On the other hand, a plate of rice (RM1), 3 pieces of beef (RM4.50), onion omelette (RM1) plus 2 steamed lady fingers (60sen) would come up to RM7.10. The beverages available here were quite standard in terms of price. You can check the price list for the dishes here. I’m sure you would like to know my verdict here. Due to the food server’s experience and skill in combining the right curries for your plate of Nasi Kandar, the overall taste was good. The onion omelette was very tasty and flavorful just like what you would get in a murtabak. The beef slices were tender but was a rather small cut. Somehow, I felt that the beef was either imported frozen ones or over simmered during the process of cooking. It lacked the beefy taste and was rather bland to my liking. The taste for the Ayam Ros was good too but unfortunately my meat was rather over fried, thus loosing the juiciness within the meat. Unless I have a lot of time to spare, I find queuing up for such a long time was a waste of precious time, especially when one has to bear with a growling tummy. I wondered why after so many decades, they still have only one person to serve you food? They could have many servers just like the rest, thus shortening the waiting time. 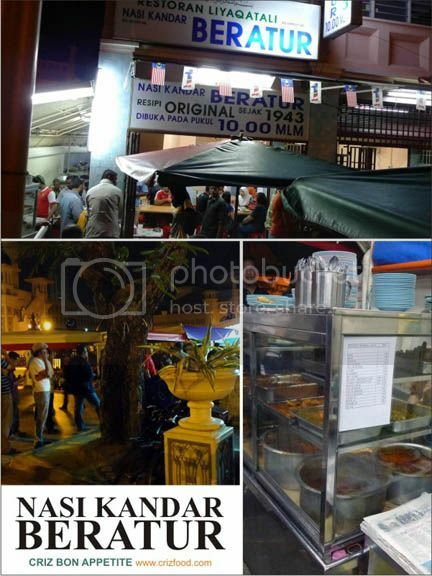 Is it because of maintaining the name of “Queuing Nasi Kandar”? I won’t know for sure. What would your verdict be then? Finding the stall won’t be hard as it is situated just next to the heritage Masjid Kapitan Keling along Jalan Masjid Kapitan Keling (formerly Pitt Street). 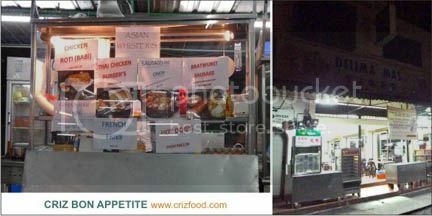 You sure won’t miss it as there would be a long queue slightly before the start of their business at 10.00pm. Parking could be quite tough here as it’s located along a heavy trafficked road. Now who’s Huan Chu Leng? 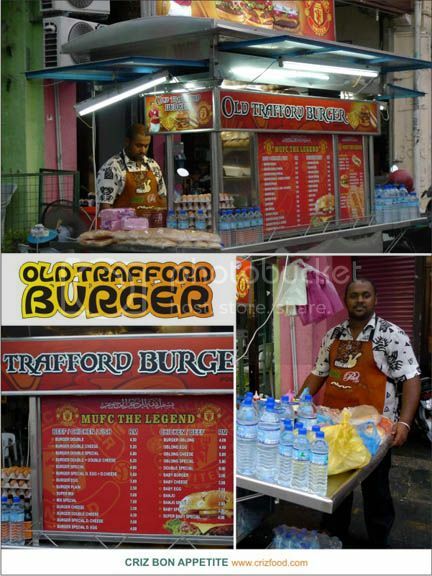 You may ask if he’s someone famous in Malaysia. In fact, it’s just a name given to a 14” long steamed bun or more commonly known as Mee Koo/Mi Koo (Steamed Tortoise Buns in Hokkien dialect). Huan Chu Leng (Potato Dragon in Hokkien dialect) is originated from Taiping, Perak, Malaysia. I have not seen anywhere else selling these delicious steamed buns anyway. 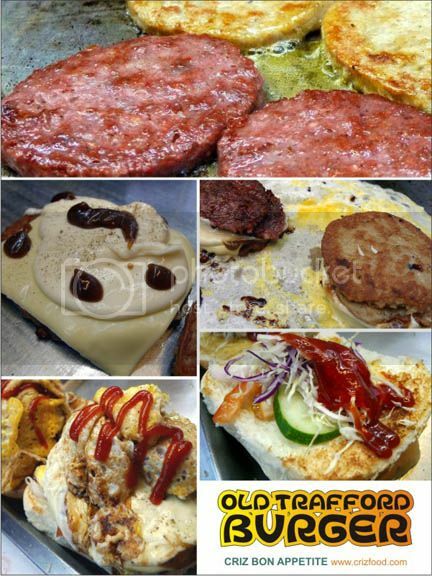 They can only be found in the night market at Plaza Perbandaran Taiping, Perak (Taiping Bowling Centre is at Level 3). It has become a delicacy amongst the locals, whether it is eaten plain, toasted or fried with eggs like French toast. What made the Huan Chu Leng my most sought after buns during my each visit to Taiping was the option to choose from the many varieties the stall has. There are basically 5 types of dough flavors such as Plain, Potato, Pandan, Yam and Brown Sugar with the options to have “Swiss roll like” filling such as coconut jam (kaya), red bean paste, chocolate and brown sugar. Such a huge bun only cost RM3.00 each. It’s darn cheap right? After so many years of patronizing this stall, my favorite is still the Green Pandan Huan Chu Leng with kaya filling. The stall is also famous for its Mini Mee Koo (RM3 for a pack of six), round pink colored buns with a flower designs and also the cute yellow pineapple shaped plains buns. Both buns are usually used for Chinese praying purposes. If you asked the locals or those from the Northern states of Malaysia, practically Penang, you would find that most buyers prefer those obtained from this stall more as the buns here have more refined textures. You can even get many flavors of mooncakes prior to the Mid-Autumn Festival month. Unless you are familiar with the road into Taiping town, you would be a bit confused with the directions as Taiping has developed very fast within the last few years. The easiest way to find the Mee Koo shop is to use the Simpang way rather than to drive all the way to Kamunting (Lake Garden and Taiping Zoo). As you exit from the Taiping Plaza toll, turn right at the first traffic light. Drive on and you would pass through a few traffic lights before you reach the main traffic light at Simpang. Turn left into Jalan Taming Sari. Go over the flyover and drive on until you see Bismillah Roti Canai shop on your left. Turn right into Halaman Pasar. Drive on until you reach a cross junction. Turn left into Jalan Kota. 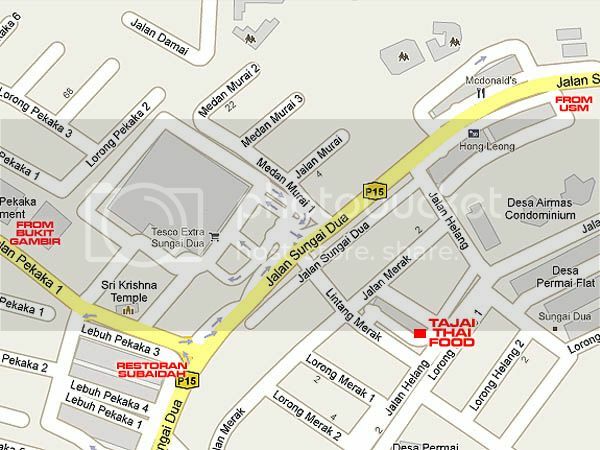 Drive on until you reach the second cross junction (CIMB Bank at the corner) and turn right into Jalan Tupai. Drive straight again after you have reach another cross junction. 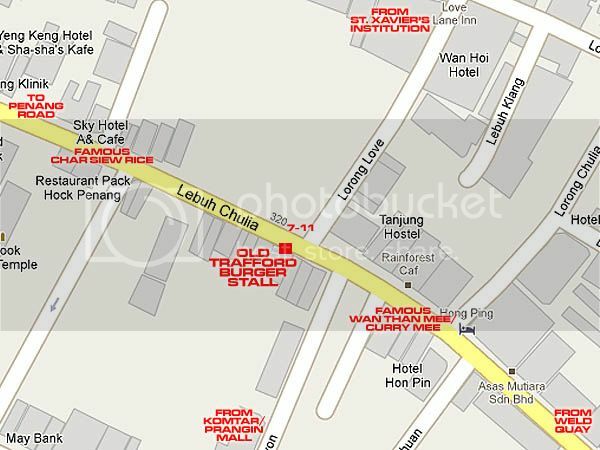 You will see the Taiping Hawker Center on your left. Take the first turning on your right and you will see the Plaza Perbandaran Taiping there. The roads here are rather messy as many of the roads are one-way. If you are still unsure, just ask for the direction to “Plaza” or “Taiping Bowling Centre”. The Hokkien speaking locals would be glad to direct you there. You can even call up Mr. Chong to collect the buns if you feel that it’s a bit too late for you to get them at the Plaza. 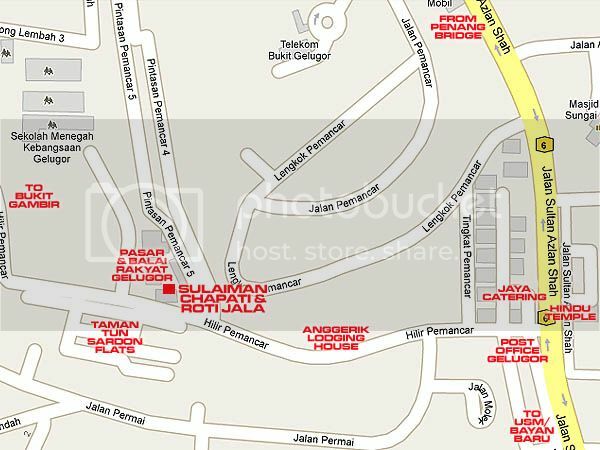 Shop Address: Plaza Perbandaran Taiping, 34000 Perak, Malaysia. Residence Address: 97, Jalan Landak, Green House Area, 34000 Taiping, Perak, Malaysia.